Sometimes, lack of planning can be a good thing. A few weeks ago, I saw the chocolate Advent calendars in the stores, but didn’t buy them because I felt it was too soon. Note to self: Anytime after Halloween is acceptable for securing the chocolate Advent calendars. Also, it is unreasonable to think that they will be available at all on November 30. 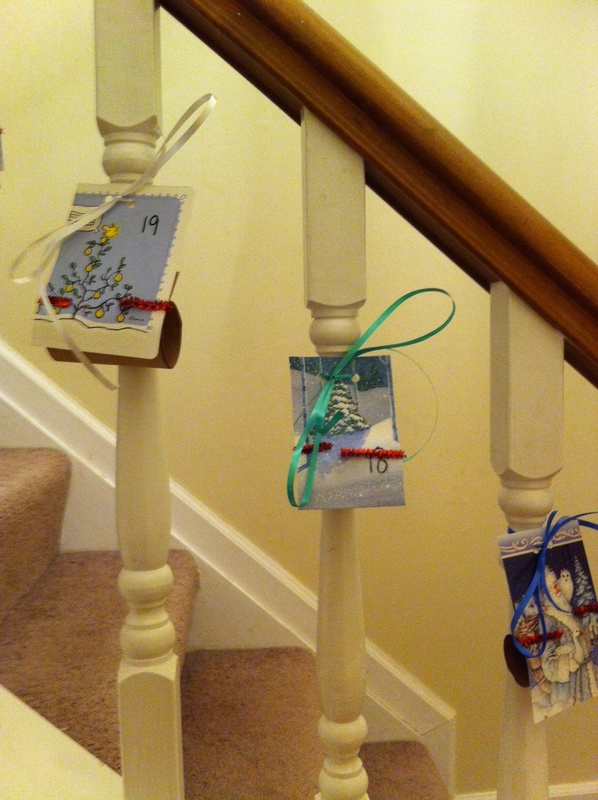 Friday and Saturday I made attempts to track down two chocolate Advent calenders with no luck. Candy loving Mam was very distraught- how ever will we count down to Christmas, how will she get candy for the month of December, whatever would we DO?!?! I promised her we would make one. I have to say, despite my own reservations, it came out just fine. Turns out, we have exactly 25 banister spindles on our staircase. How lucky is that? 1. Cut the cards to desired size- I went with about 3×5, and then punch two holes in the top of each (if tying- the other thing you could do is use clothespins on a line of ribbon). Number each card- I used a marker, of course you could print stickers if you wanted to get fancy. 2. Cut the grocery bag into strips that measure just narrower than your cards, and a bit longer- mine were abour 2.5 x6 (clearly, I did not use a ruler). Any kind of paper would do, we just happened to have these bags handy. 3. 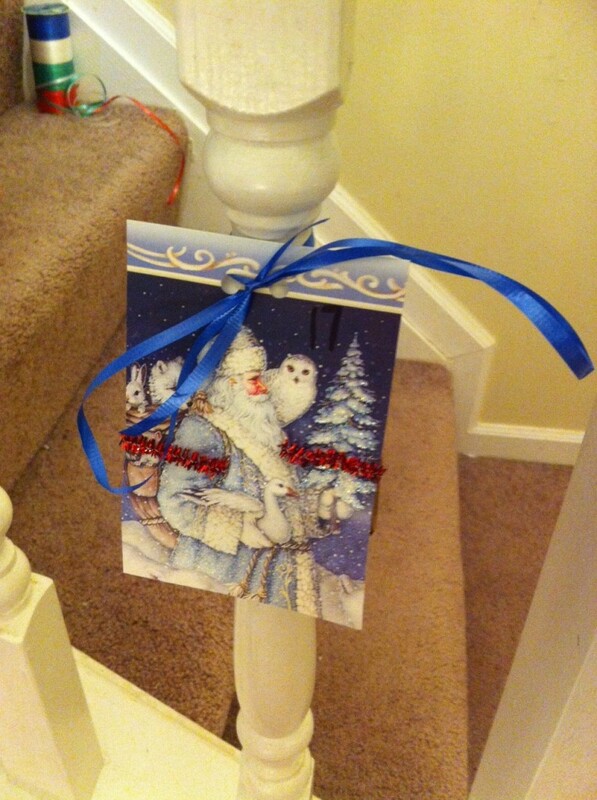 For each card, glue the strip of brown grocery bag onto the back of the card. 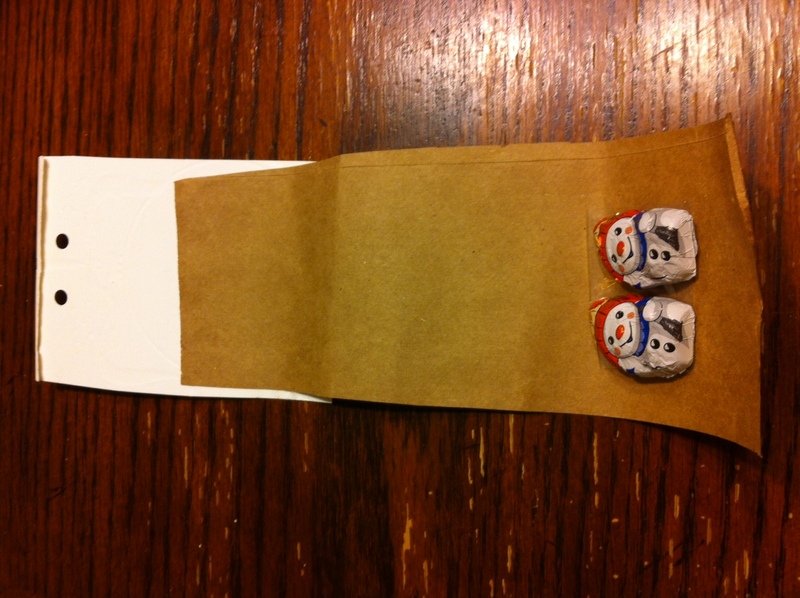 Write a message and/or tape the candy or trinket to the botom of the paper. Somedays, there’s just a treat. Other days, I jot a note about what we’re doing. 4. Carefully roll the paper up, and secure with either a ribbon or pipe cleaner. 5. Repeat until all 24 cards are made. 6. 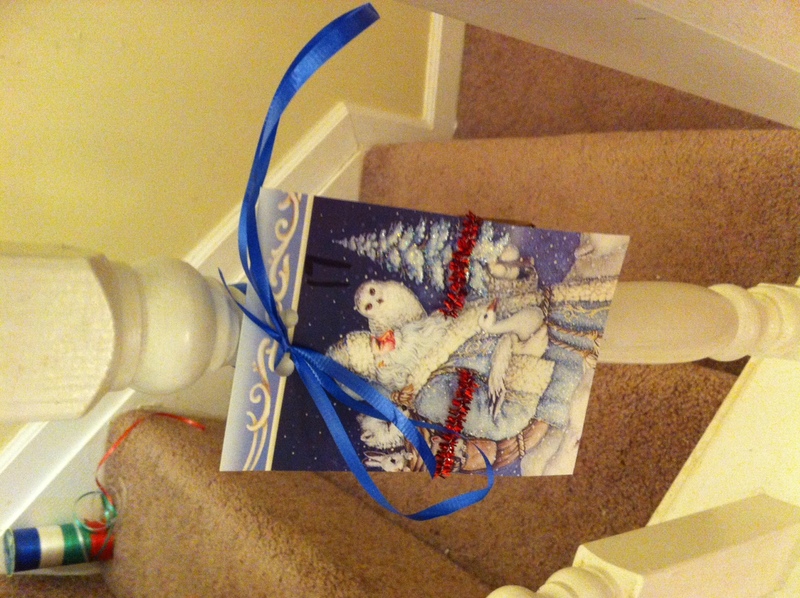 Once done, you can hang them from a fireplace, from a staircase like I did, or even clip to a ribbon with clothespins. Each day, the kids run to the countdown card, and unroll the message. They are working their way down the stairs. I know it will seem like FOREVER to them, but they’ll be down the stairs and enjoying Christmas morning before I know it. Love the idea of having it go down the stairs! I’m pretty sure if I had attempted this I would have started at the bottom. Duh. Also, I love this because we have a wooden house with 25 doors that open… 25 teeny, tiny doors that barely fit anything inside. Dumb. Ha! Smart….or cheap. I’ve always wanted one of the those houses with teeny-tiny doors. But you bring up a good point- what would fit in there?!?!? Also, I think the credit for going down the stairs comes somewhere from Pinterest, I forget where!! Great idea! I imagine the kids will really enjoy the countdown. It’s wonderful that you keep the Advent traditions. Right now they maybe focused on the candy, but in the future they’ll remember the preparation that led up to Baby Jesus’ birthday.